kurenai is a kunoichi with long and black, shoulder-length untamed hair, and very unique eyes that are red in colour, with an additional ring in them similar to the Rinnegan, albeit less ripples. She wears make-up consisting of red lipstick and purple eye shadow. Her regular outfit consists of a red mesh armour blouse with only the right sleeve visible. Over this is very broad material which resembles bandages with a pattern on it similar to those of rose thorns. 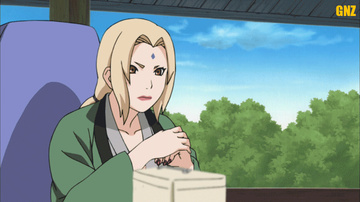 Her hands and upper thighs are also wrapped in bandages and she wears the Konoha forehead protector and regular shinobi sandals.